It appears that I am a day behind. Having tapped off at least 100 images a day for the last 3 or 4 days a backlog is a certainty. Yes, here I am wanting to blog about yesterday(Friday) and finding that I am having to include images from as far back as Wednesday and Thursday. So on this note, let me jump back to Wednesday. 05:45 and I hop out of bed to do a “sky-check”. Our bedroom faces west and I have no view to the east unless I wander through the house to look out of another window. If I am truthful I can actually look westwards without getting out of bed as I can see the sky between the blind and curtains. Checking the weather and the cloud base therefore means getting out of bed. A quick totter to the window revealed a clear sky, twinkling stars and an over flying aircraft with a feint vapour trail in the dark but slowly paling sky. Coming up with new ideas for a decent sunrise shot is getting quite difficult. 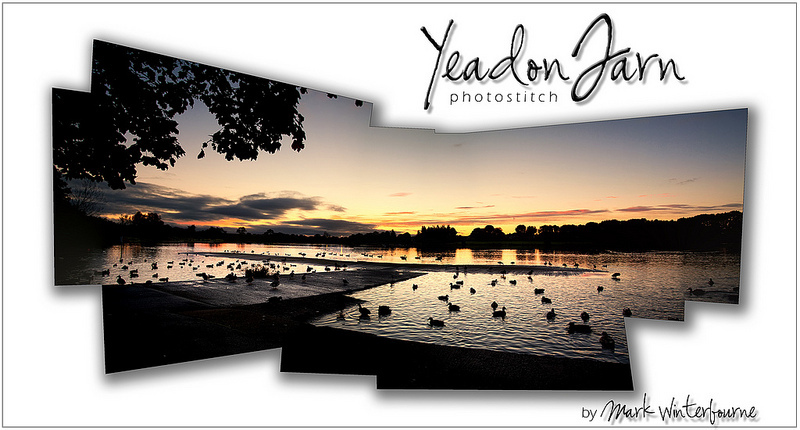 Yeadon Tarn is a great place for wildlife, water and trees as foreground and even aircraft. As am sure you will appreciate that once you have done something a few times it’s actually nice to have a change and try a different approach. Over 2012 I tried one or two different locations including the airport all of which proved very successful. I discovered that spreading the locations about over the twelve months allows different images as the sunrise location changes throughout the year. The weather and clouds play a huge part of this too with no two days being the same. After grabbing a quick coffee I proceeded to de-ice the car and headed off to Yeadon Tarn. In an ideal world it would be nice to see it as still as a mill-pond with no wind, an ideal photo opportunity. Rarely does this happen as its location is quite high above sea level. From the area around the Tarn there are good views with great foreground subjects facing in most directions. In particular the view towards the airport runway makes for superb shots of aircraft taking off and landing in to the rising sun. I must admit that I don’t usually go for the aircraft option whilst I am by the tarn as the runway is about 20 feet higher than the level of the tarn making it quite difficult to obtain any decent background detail. I parked my car in the easterly car park and just 20 yards from that spot I am able to get some very pleasing images of the rising sun. 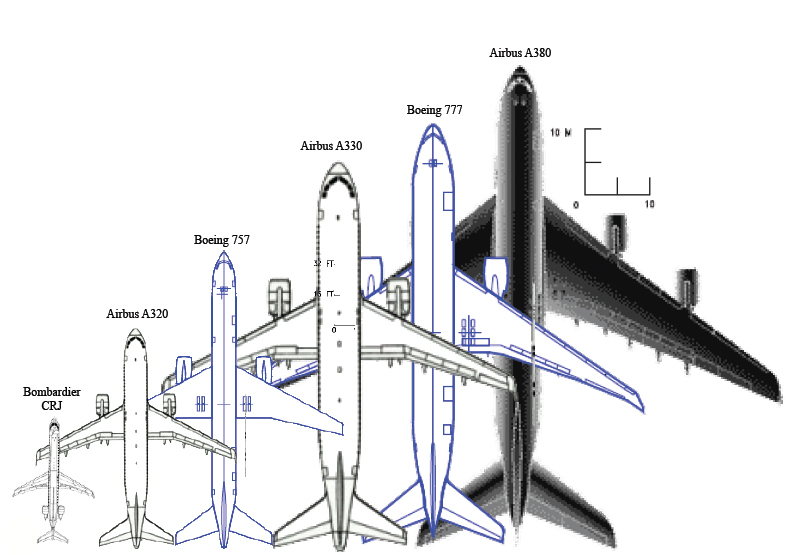 Below you will see what I mean about the departing aircraft. I wouldn’t normally include an aircraft in a sunrise where the sky had clouds to reflect colour and give some definition to the image. This morning it didn’t matter, the sky was clear with hardly a cloud. My vision was about to be become reality. As the sun just started to emerge over the horizon I could hear the noise of jet engines roaring in to life. An aircraft was about to depart. I had my plan laid out. I would capture the aircraft in single frame, then holding the exposure I would capture then same scene to the left and the right of the aircraft. This would enable me to stitch the three images together to make a panorama. The panorama looks more appropriate in a sunrise or sunset shot when there is a lot of plain foreground with no detail. See what you think, the shot is shown above. Or should I say three shots. I actually regard this series of images as one of my best mornings yet. There was one more image that just screamed out “Take me, Take me”. From my location looking across the water the colour had now turned a bland yellow and was fusing with the now blue spring sky. However looking left just out of the direct sun I noticed a woman walking a dog. As she proceeded towards me I lifted my camera and tapped off a couple of frames. You could see her breath in the cold morning air. Both the dog and its owner cast long black shadows in front of them which made for a lovely composition as she walked the path through the gap in the bushes. The final image is shown below. Once the sun had risen all chance of getting anything decent whilst facing east in that direction were non existent. It was just way too bright. So I decided to call it a wrap and headed off back home, to the warmth and a chance to sit down with my beautiful wife and have some breakfast. Thank you for reading. As always, comments welcome. A few years ago I dabbled in making panorama images using Photoshops’ Automated photo merge tool. As the tool is integrated in to Adobe’s CS5 package; unless you have mega memory it tends to be very unreliable and in my experience has a habit of closing itself down halfway through its operation. I found this so frustrating I decided to look elsewhere for some stitching and panorama software. This was when I stumbled across an early version of a program that was going to change the way I saw things. From 2:3 ratio to Panorama ! 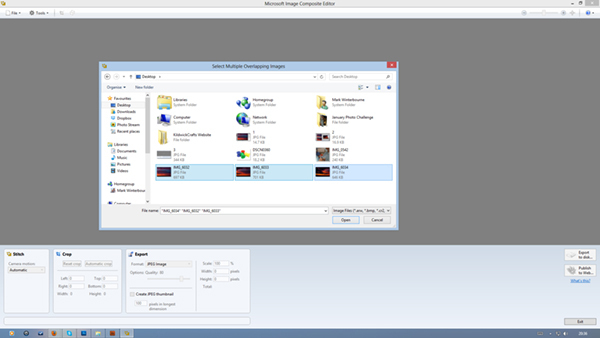 Microsoft Image Composite Editor (ICE) is a free, yes FREE piece of software for Windows that will stitch overlapping images. And because its dedicated to stitching it works very quickly and is very accurate too. It can be used stand alone so you don’t need to own a copy of Photoshop to turn out panoramic images of excellent quality. Obviously to adjust and edit your finished piece a copy of Photoshop or any other editing and manipulation software is essential. 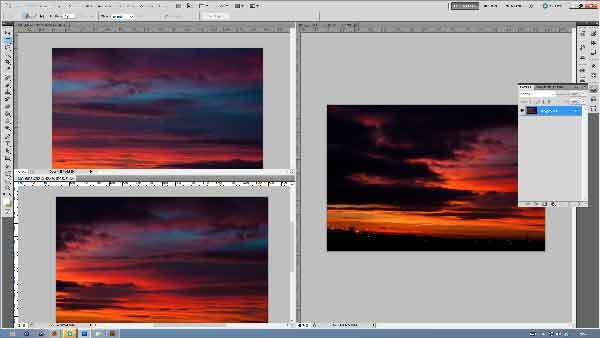 I am going to show you the process of a simple panorama image, from the RAW images to the finished piece. Hope you enjoy, and remember to try it yourself, you can do it with a mobile phone app these days, but trust me when I say…this way is so much better. The first task is to capture a series of images that overlap. The overlap is the important bit here, in matter of fact it’s quite essential as ICE (Image Composite Editor) relies on data being matched in order to stitch the images together. One thing to note is that the images don’t have to be in a landscape format, they can be in a square or even in a random shape. Which ever way you decide to compose your images the same rule applies…they must all overlap for the ICE to work. I have selected three sunrise images (Fig.1) all taken within 10 seconds of each other. You can probably see the obvious overlap on the photographs before we even begin to stitch them together. This is very important. 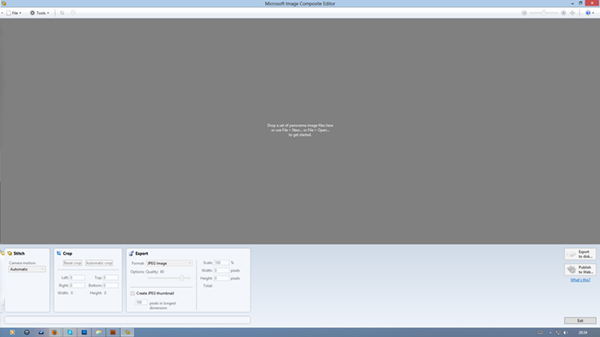 Open your images from your camera either in to Photoshop or straight to your hard drive if you have no photo editing software (Fig.2). If you have no editing software then skip to the next step and open ICE. One thing to bear in mind when shooting the images is to get the exposure as accurate as possible and be consistent over the series you shoot. This will help you considerably when editing and finally stitching the images. If you find that one of the images is over or under exposed it will clearly stand out amongst a stitch of several images. Its much easier to get it correct first time than go back and make adjustments and have to do the stitch all over again. The crop boundaries can be adjusted according to your requirements, once you are happy it just a case of saving your image to your location of choice. 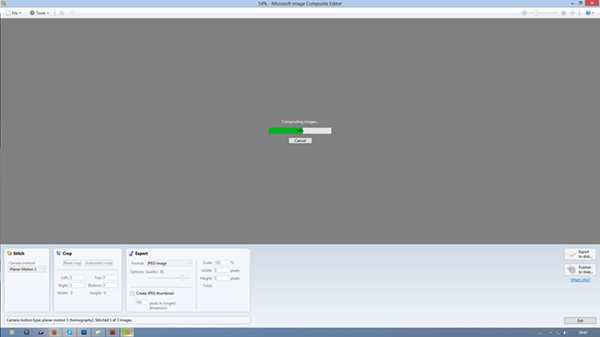 This is done by clicking “export to disk”. So there you have it. 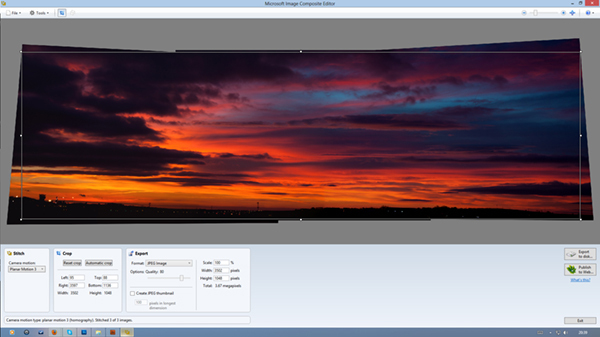 A very easy and effective way of creating either a landscape panorama or a general photostitch. There are many possibilities with stitches, not just landscapes but in general photography. It can be great fun to capture a group of people, particularly a few who are moving around, occasionally you can find the same person in the stitch in more than one location. Below is the final image (Fig.8) I created from three single frames using the steps above. Hope you like it, any questions or comments, please do not hesitate to contact me or leave a message in the comment box on here. Thank you for reading this post. If you have as much success as I have doing this, please contact me and show me your stitches, I would love to see them.